ASQ asks the question about the next generation of STEM (Science,Technology, Engineering and Math) professionals. My personal experience is that STEM is very much alive and well, with lots of opportunity to grow, especially in Canada and the United States. On a personal note, mentoring and motivating is what I do all the time. More importantly, both my sons went through science programs in their university years. One moved on to the world of high tech and internet start-ups and the other to medicine (In an on-line survey [ http://scienceblogs.com/terrasig/2009/12/06/do-you-consider-medicine-and-t/ ] that asks the question are medicine and allied health professions STEM disciplines(? ), over 80 percent vote to the affirmative). Both have great careers, and importantly have integrated Quality and Improvement into their professional activities and development. At my university, Engineering is thriving very well. It continues to have far more applicants than places and continues to require extremely qualified students. The faculty apparently offers courses in a broad diversity of sub-disciplines at a variety of levels, and apparently all are filled to capacity. It is difficult to talk about how well or unwell STEM disciplines are doing. In another fairly recent study [see: http://www.conferenceboard.ca/hcp/details/education/graduates-science-math-computer-science-engineerin.aspx] it appears that there is opportunity for growth in STEM education in North America (see the figure), although I have to say that if this figure is an example of the state of STEM knowledge we have a very serious problem. Measuring by percentage of graduates has to be just about the poorest application of statistical analysis, ignoring more important issues like, population size, numbers of universities, variety of faculty choices, and many more important variables. 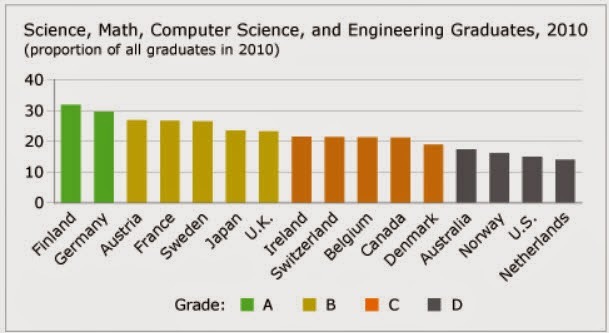 Without looking too deeply, one can say with absolute and total confidence that the United States creates many, many, many fold more STEM graduates than does Finland. If we have an apparent increase in vacancies in STEM positions, I think there are a variety of factors that need to be taken into account, at least in Canada, and probably the United States. At one time the United States dominated in science and technology positions. Today the positions have become far more internationally distributed. The costs of university education have continued to climb, and many people are questioning the wisdom of leaving school with debt of $200K or more. Scholarships can make the entry decision easier, but having the confidence of an opportunity when the smoke clears is probably at least as important. If the classifiers of STEM disciplines classify their positions narrowly, they are excluding many graduates that are indeed science oriented. Fields including biotechnology, genetics, pharma, nano-tech, tele-health, are making revolutionary change who we are and what we do and will continue for many years to come.